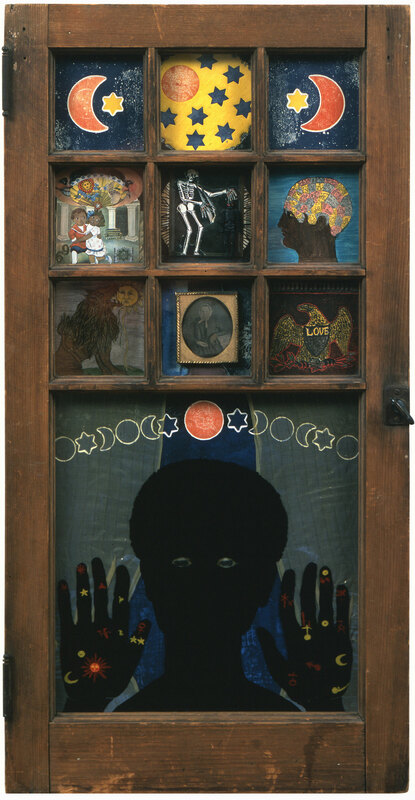 Black Girl's Window was created during a pivotal time in Saar's artistic development, as she began working with iconography that alluded to her heritage, personal biography, and astrology. The African American female silhouette is presented at the bottom of the window, and small tableaux representing destiny, phrenology, and love cascade across the top. The lion, representative of Saar's astrological sign, is inserted along with iconography of family, youth, and home. A daguerreotype image of Saar's maternal grandmother is in the bottom middle window, referencing the artist's Irish heritage. With Black Girl's Window, Saar delves into her personal biography and spirituality, engaging the personal, the political, and the mystical. "Black Girl's Window." Now Dig This! Art in Black Los Angeles, 1960–1980 Digital Archive. Los Angeles: Hammer Museum, 2016. https://hammer.ucla.edu/now-dig-this/art/black-girls-window/.